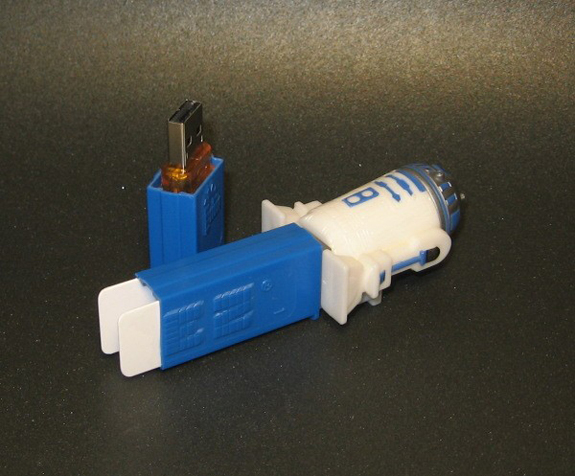 We have seen lots of fun Star Wars themed USB drives, the latest is this fun Star Wars R2D2 Pez Dispenser USB Drive. As the name would suggest, the Star Wars R2D2 Pez Dispenser USB Drive is made from a Pez dispenser, and has a hidden USB drive inside. The Star Wars R2D2 Pez Dispenser USB Drive comes with 2GB of storage, and is available for $25 from Etsy, although I am sure it would be easy to make your own.